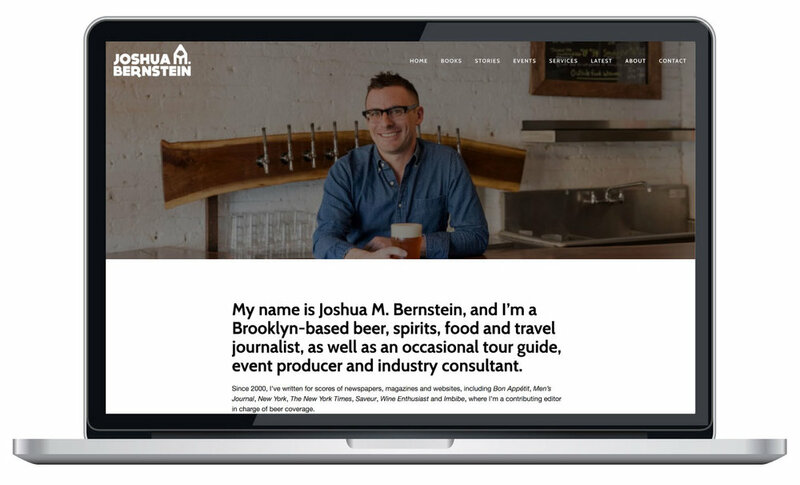 Objective: create a brand and website for Joshua M. Bernstein, a journalist with multiple books, numerous stories, events, and various other services to market. In other words, it was a mishmash that needed a unified vision to quickly drive site users to their desired destination, be it consultation or his latest event happening. Josh's brand is quirky and bold, yet polished and professional. His writing and community-driven events are extremely unique, with a certain sense of humor that I wanted that to communicate in the brand. To further personalize Josh's brand, we utilized his fun and colorful street art photography as banner images. This adds a nice Joshua-specific flare, as well as supplies a consistent feel across the site. The challenge with creating a logo for Joshua M. Bernstein is that his name is long, with an initial that needs to stand out and read as the full name. I took the letter M and used it to illustrate his brand. Foremost, he is a writer. Some initial experiments used the M as a typewriter key, others as part of a pencil shape. Josh has a vibrant personality and writing style, so I wanted that to come across within the logo. In the end, we chose a unique and bold typeface with both hard and curved edges. The M was transformed into a chunky pencil forming his middle initial to create the final logo and submark you see below.